A cannabis business without a strong inventory auditing policy is like snowboarding without snow. You may get to where you are going, but there’s a whole lot that can go wrong along the way. Knowing what inventory you have on hand is essential to understanding your customer’s preferences, boosting your bottom line, and keeping you in the good graces of your state or provincial regulatory authorities. Why is Auditing and Inventory Counting so Crucial? When it comes to cannabis, the leading reason for inventory auditing comes down to community safety and compliance. The local government in which a dispensary operates is responsible for keeping legally produced cannabis out of the wrong hands, whether that is children or the diversion of cannabis into the black market, which is then sent to non-legal locations. To ensure local cannabis authorities can track all cannabis as it moves through the legal market, inventory auditing is key. And since the stakes are so high, these local authorities charge a very high price for major inventory tracking failures, costing business owners thousands of dollars or their license to operate. From a business perspective, auditing and inventory counting helps you run your business better. Regular inventory audits alert dispensary owners to discrepancies early so they can address the problem, whether it’s internal or external theft or just a mistake. Plus, a lot can be learned about customer preferences with a deeper look into inventory management. Sales reports and inventory checks are rich with customer insights. Find out what products in your inventory are fast movers worth buying again and which products are lagging behind. From there, as an example, a dispensary owner can optimize sales and promotions to push slow moving products out the door faster, making room for different options. 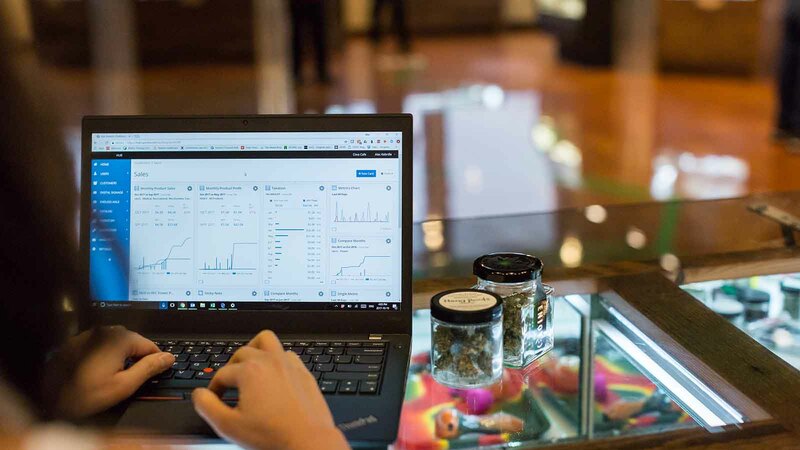 All of these insights can boost a dispensary’s bottom line – and all it takes is strong cannabis inventory management. 1. Design your own inventory auditing policy and stick to it. Strong inventory management requires two basic things: a strong foundation and consistency. Each cannabis business will need to create an inventory auditing policy that works for them and their local government, but once that policy is finalized, it must be managed consistently for it to work. Generally speaking, every dispensary should undergo a full inventory audit at least once per month or more depending on legal regulations. 2. Perform regular inventory counts. Every inventory audit policy should include a daily inventory count and reconciliation. Accuracy is of utmost importance! Any cannabis point of sale (POS) system worth its salt will allow you to print a full inventory report showing what is currently listed in the system. Then it is time to do a physical count. Employees will use the POS report to check against the physical inventory in the store, creating an inventory on-hand report (this can be done via Google Doc as well for ease of collaboration). These on-hand inventory counts should be done by category or supplier and should include the supplier name in the product name so this information can later be sorted in Excel. Save large categories, like edibles or pre-rolls, for slow days. 3. Adjust and provide details to government. At this point, a dispensary will know what inventory is currently reported in their inventory tracking system and their physical, on-hand inventory. If there are any discrepancies between the two, update the count in your inventory tracking system. If the discrepancy is particularly large, you can help your case by providing additional details about the error to the local government. 4. Report inventory results and discrepancies to regulators in a timely manner. As mentioned earlier, local and federal governments require transparency when it comes to cannabis inventory. That transparency comes with strict track-and-trace and reporting requirements. Generally speaking most of them require auditing every 14 to 30 days. But each government does it a little differently. In California, the state government requires cannabis dispensaries to do inventory reconciliation every 14 days. In Alberta, the provincial government requires a monthly report on the 7th day of each month and an inventory audit on a monthly basis (after which any discrepancies should be reported). In Oklahoma, monthly reports are due on the 15th day of each month; the first gross discrepancy will cost a $5,000 fine and a second offense in a two-year period will result in loss of license. These government-to-government differences illustrate just how important it is for every cannabis retail owner to know their local regulations. Strong cannabis inventory management is vital to running a healthy retail cannabis business. Subscribe to our blog for more tips on boosting your dispensary’s bottom line, avoiding compliance-related fees and penalties, and understanding your customers!